I'm Here. I'm Queer. What the Hell do I read? : Wicked Pretty Things: An YA Anthology That Tried To De-Gay A Character and How Two Writers, Jessica Verday and Seanan McGuire, Stood Up And Said "NO!" 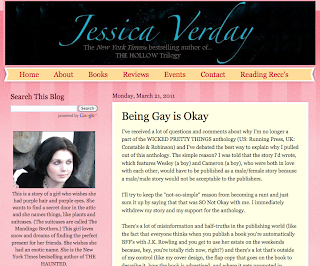 Wicked Pretty Things: An YA Anthology That Tried To De-Gay A Character and How Two Writers, Jessica Verday and Seanan McGuire, Stood Up And Said "NO!" "a collection of dark fairy YA stories (with a bit of a romantic edge)." Last week Jessica announced she has pulled her story, "Flesh Which Is Not Flesh," from the collection. Why? "I was told that the story I'd wrote, which features Wesley (a boy) and Cameron (a boy), who were both in love with each other, would have to be published as a male/female story because a male/male story would not be acceptable to the publishers." "And the message I want to send is this: You don't choose who you fall in love with and you don't choose to be gay. We're constantly bombarded with messages from sick people who try to tell us that it's a choice or a lifestyle or an agenda. But Wesley and Cameron's story isn't an agenda or an issue. It isn't an "I have to prove something to the world" story. Wesley and Cameron's story is a love story. About one boy who loves another boy so much that when something bad happens to him, he'll do whatever it takes to get him the help he needs. Just bittersweet, hopeful, first love. And I think the world needs more of that." But here's the thing - standing on principle is what changes our world for the better. Jessica is standing up and calling them on this, and that's great. But wait, the story gets more interesting. "Would you include your story if the publisher let you keep it as an m/m story? - I have been asked by the publisher if I would reconsider including it in the anthology due to the fact that they would be perfectly okay with accepting it as-is (meaning m/m, not m/f), but I have said no. I was informed that Trisha Telep would still be the editor for the anthology (and considered the "author"), and due to her preconceived notions, I can't support any of the royalties from this project going to her." "In light of the ongoing situation, my own discomfort with this whole thing, and the fact that discriminating on basis of sexual orientation is never okay, I have withdrawn my story from the collection. I am not withdrawing from this book because I'm not straight. I am withdrawing because of my little sister and her wife, and because of my girlfriend, and because of my best friend, and because of all the other people who deserve better than bullying through exclusion. Thanks to Jessica for bringing this to our attention, and thank you to everyone who has been supportive of my decision to withdraw. I am sorry this had to be done. I am not sorry that I did it." I am beyond proud of Seanan for also standing up. Here's the thing: If enough authors stand together and say "NO!" to this kind of homophobia, it will stop. The cost (in bad publicity) will be too high, and publishers and their editors will have to think twice about these sanitized for the status quo's protection moments. Because the status quo has way too much hate and bullying and exclusion of queer characters and queer love in it. And Jessica and Seanan are standing up for us all. And I'm cheering them on. And yet... at the same time, I'm a touch confused about what's going on and I wonder about the path forward. If this was an organized labor-inspired queer rights moment, I would have thought the goal would be to do what could be done until the editor and publisher agreed to include the queer love story as is. Jessica's ongoing refusal is now based on the editor's continued involvement, which leads me to think there's information about what's going on that I don't have. But it needs to be said that I want there to be queer stories in anthologies that aren't ALL queer - it's a way to reach kids (like me) who were too deep in the closet to dare pick up an overtly queer book. I sincerely regret the sequence of events which has led to Jessica Verday’s story ‘Flesh Which Is Not Flesh’ being excluded from the forthcoming anthology Wicked Pretty Things. This has been the result of a misunderstanding on my part which is entirely regrettable. Along with publishers Constable & Robinson Ltd, who commissioned the anthology, and Running Press, who are due to co-publish the book in the United States, I fully support LGBTQ issues. I apologise wholeheartedly for any offence that I have caused and offer the assurance that I would not in future reject any story on the grounds that it included a gay (or any LGBTQ) relationship. I don't know how this is going to ultimately resolve. But what I do know is that between Jessica and Seanan's three blog posts about this, they've had over 750 comments in the first week. Word is getting out that de-gaying children's and teen literature is NOT okay. That authors won't quietly agree. That editors and publishers will be called on their homophobia. And that shift in "business as usual" is the best news of all. ps - my thanks to Joni and to Mark for making sure I knew about this, so I could share with all of you! Via a reader from twitter I was told that 5 writers have dropped out of the anthology. Great post, Lee! I've been following this via Cleolinda (she's very good at finding all links), and I love your thoughtful take on the events thus far. I think authors pulling out is a good call, regardless of the editor's 180. Just as you said, if we send the message that being anti-queer will get you negative publicity and won't be tolerated, it won't be done. If they went back after the editor backpedaled, I'm not sure that would send the same message. She needs to do more than lip service. What I love is that three more writers pulled out of anthologies being put together by the same editor that are NOT Wicked Pretty Things. Fantastic. And, I'm sorry, but the editor's reference to "alternative lifestyles" in her kinda-sorta apology ain't gonna cut it. Aha! I see your comment in that updated post by Cleolinda. Better to be repetitive than to ignore, I suppose, LOL! I would guess that this started because the editor assumed the publisher was planning on marketing the book to schools. The market reality is that schools are willing to put LGBT books in high school and age appropriate LGBT in middle schools but not elementary schools (as Lauren Myracle found out). But it seems the publisher does not have the educ. market in mind for this book and is willing to welcome LGBT content. It's an understandable mistake. They've apologized. They've made the only remedy they can make--to welcome LGBT stories in the anthology. So I'm puzzled by the continued drive to humiliate this editor. How is that not bigotry? I am a strong believer in the power of the boycott. It has across the ages done a lot of good. But it is a blunt instrument. If you continue to beat up the repentant, they will not embrace your cause. Right now the authors are basking in the feelgood vibe that comes from social networking buzz. But they have deprived the future readers of the anthology of a story that might have moved them to a better understanding of GLBT people. It's a story that might have reached out and saved the life of some closeted kid in a little town with no one but books to turn to. So how is their continued refusal to participate in the anthology a boon to the cause? I wonder, too, whether the authors who have since left have done so because they are afraid of being labeled as unsympathetic to the cause and blacklisted by the twitterverse which seems so very powerful to most writers. Maybe the writers do care deeply about the issue, but I bet in the back of their minds they're thinking, if I don't declare myself on the trendy side of this issue, I'll never get a blog interview again. I would hate to be in that spot. If the publisher refused all LGBT content that would be one thing, but this feels more like a vindictive statement than a principled stand at this point. The preposterousness of insisting the story be changed then back-pedaling with "the decision was too rash" as if it was all a case of editors Tourette's. For cryin' out loud, if you believe in something (however decrepit) then stand up for it! But when they capitulate so quickly it's as if they didn't even believe in it in the first place. Surely there's a special rung in Hell for those pushing agendas they themselves don't even believe in. (Homophobe congressmen, the Righteous Eye is looking at you!) Utterly mystifying! Have you seen the response from Running Press's publisher? I guess I'm more than a little disturbed that a self-professed openly gay man is referring to homosexuality as a diverse "lifestyle." Is he still living in the 80s when that term was all the rage (and before someone pointed out 'Ya know, that still implies it's a choice...')? Honestly, that PW bit bothered me as much as Telep's original statement to Verday.